Last week, I offered you an insight in my tactical tinkering during a match. 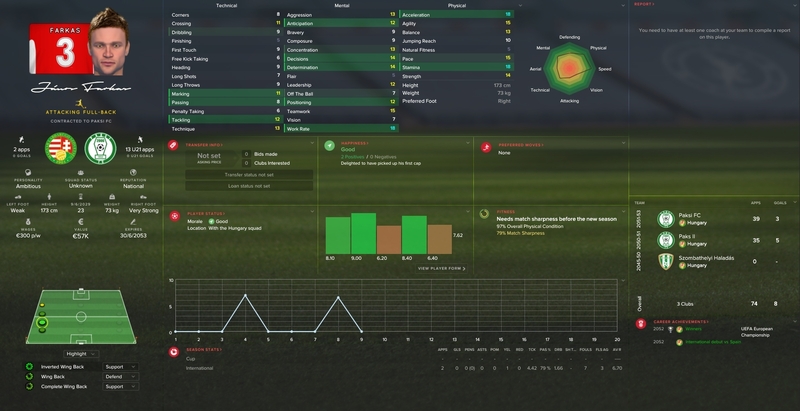 I was managing the Hungarian national team in their opening match of the 2052 European Championships versus the Czech Republic, gaining a creditable 1-1 draw and keeping the somewhat superior Czech threat contained for most of the match. In this match, we’re going to be needing a whole lot more of that defensive containment seeing as we are up against La Furia Roja; the mighty Spanish national team. Compared to the previous match, not much has changed for the Hungarian side, apart from the absence of left wing-back Richard Nagy, who was red-carded during the match against the Czech Republic. Lest we never forget, here is a picture of Nagy picking up his second yellow card, subsequent red card and suspension for the game against Spain. Farkas came in for Nagy at left-back because of this suspension. All the other players were fit for duty. None of them had fitness levels below 90% and morale was good for the lot of them. Not losing while being the underdog tends to be good for morale. Our second opponent during the 2052 European Champions was Spain. Even when this is 2052, Spain can field a world-class team. By only posting a screenshot of their squad, you can see how the Spanish team might be compared to ours. The backbone of the team is still formed by players from Athletic Club, one of my former sides. England has a backbone of West Ham United players because of me, Spain has a similar Basque backbone because I set up Athletic Club’s academy in a similar style to West Ham’s. Needless to say, this is a world class squad. These guys are tipped as favourites for the title together with the English and Germans. Much like the Czech Republic before them, the Spanish were likely to field a 4-2-3-1 formation. I did anticipate some differences between the two sides. The Spaniards would play with proper, world class wingers, who will remain high up the pitch, as well as the midfielders and defenders to launch them. Their #10 playing in the hole would most likely be a runner, a mobile playmaker who can link up with their deep forward, turning their one-man-forward-line on paper into a two-man-forward-line in reality. The initial idea against the Czech Republic was to crowd out the Czech forward with two defenders while the defensive midfielder could pick up the attacking midfielder. In this instance, considering their tactical setup and the level of quality of their players, I opted for a more conservative approach. The three-man defence consists of two players on stopper duty and one on cover duty. The players on stopper duty are likely to step out and pressure the players in the attacking midfield stratum, whereas the two ball-winning midfielders are also likely to drop back and help out defensively. This frees up the wing-backs to deal with the Spanish wide men while receiving cover from at least one central defender on their flank. Against the Czechs, we played in a Counter setup. I rated the Spanish side higher than the Czech side but decided to maintain the counter setup. The compact and cohesive shape of the tactic worked out just fine and I dreaded that dropping any deeper would be inviting Spanish pressure and inevitable doom on our Magyar defence. Since we started this game cautiously, not wanting to fall prey to the Spanish attacking machine that trashed Austria by three goals in their opening match. La Furia Roja generally played an aggressive high pressing game but my teams ideally set up to evade their pressing. The three central defenders, along with Fedor in defensive midfield and the two wing-backs, beat Spain’s primary pressing regularly. The extra man at the back ensured the ball could be passed around the high press. Since there are no wing-backs to flank the back three, they can spread wide when the team has possession. The goalkeeper can easily roll it out towards one of the central defenders to start a patient build-up. The wing-backs would generally tuck inside to receive the ball, with the two ball-winning midfielders dropping deep to receive the ball. This allowed us to bypass the Spanish press and keep possession. It also created time and space for the man in possession to attempt a long-range pass if the opportunity presented itself. That was our primary means of defence, keeping the ball. Whenever we had it, the Spaniards didn’t, which meant they couldn’t score against us. When a Hungarian player did run into trouble, he simply hoofed the ball forward. Losing the ball to the Spaniards in our own half could’ve had disastrous consequences, whereas hoofing the ball forward presented the Spaniards with the challenge of breaking down the rather tight and cohesive Hungarian defence. Now I realise that the words “long ball” are often considered to be some sort of faux pas in modern-day football, as some sort of aesthetically-displeasing disgrace to the game practised by cave-dwelling Neanderthals. While I shall refrain from passing judgement, I want to point out that the long ball style definitely has its merits. When you get the ball forward quickly, it allows you to maintain your defensive shape and thus integrity, because your defenders and midfielders do not have to move around a lot to get the ball forward. Since this is a strikerless setup, our game plan is less about hitting long balls behind the defence for our speedy wingers to run onto and more about hitting long balls for our withdrawn targetman to hold-up and flick-on to runners, or, move toward and score himself. The latter would not be very likely in this instance but the former would allow us to keep hold of the ball and deny the Spaniards the chance to break through our lines. Our passing-chart for the opening 25 minutes of the match reflects this game-plan. We can see a lot of long-range passes and even while not all of them were successful, we did a pretty good job of getting past the Spanish press and find our attacking midfielders in space. For a defensive setup, we had a lot of the ball inside the Spanish half because we simply bypassed their forward four players and the Spanish central midfielders tended to drop back to pick up our attacking midfielders, granting us control of the central midfield area. The majority of our build-up started with our #5, László Kertai. He would typically receive the ball rolled towards him by the goalkeeper and dribble forward, backed by the other two defenders and one of the ball-winning midfielders dropping deep. He generally had two to three passing options at his disposal. Cross-passes towards the attacking midfielders or a shorter diagonal pass to the wing-back. While not all Kertai’s passes were successful, we have to keep in mind that he is a defender for the Hungarian national team, representing Belgian Jupiler League Pro side KV Mechelen and not some reincarnation of Mats Hummels or Gerard Piqué. This setup easily allowed us to keep possession, though it gifted us no chance to break through the Spanish defence. Four defenders and two defensive midfielders, all world-class; that’s a tough nut to crack for any side. On the other hand, we didn’t really set out to score a shitload of goals, we set out to contain the superior Spanish team by finding cracks in their armour and exploiting those. In this instance, it became clear that we had found that crack. The Spanish central midfield was not positioned well and allowed us free reign in the central areas of the pitch. The passing-chart for La Furia Roja backs this conclusion. In the opening 25 minutes, the Spaniards were unable to penetrate our penalty area and in fact barely got the ball in central areas, being mostly contained down the flanks and forced to try ineffective crosses towards our three waiting defenders. Their shooting was similarly ineffective. In 25 minutes, this world-class outfit had managed two entire shots on goal, both from outside the penalty area, both from direct free kicks. One of the shots was blasted wide, whereas the other was an easy pray for the Hungarian goalkeeper Krisztián Antal. The game-plan was working like a charm. Keeping in mind that we had actually managed to contain the Spanish threat thus far, I decided we might as well be a little cheeky. Sneaking in a goal would surely not hurt anyone? I decided to play more offensive, selecting a Control mentality. This committed our wing-backs more to the offensive, reinforcing the three attacking midfielders while not sacrificing the defensive stability too much. This ballsy move didn’t result in a great many chances but the one chance we did create came from the overload created by five players moving towards the Spanish penalty area. The final pass was lacking precision but it was a major chance, even if the game didn’t recognise it. I will let you be the judge. With two Hungarian players in front of goal, Farkas makes it painfully obvious why he was the second-choice for left wing-back in the Hungarian national team. His cross hobbles across the backline without even coming close to finding a Hungarian player in front of goal. While it did not result in a goal, this attacking move did showcase how important the added offensive weight of the two wing-backs was during this phase of the match. The halftime break gave us few problems when considering our gameplan for the second half. Spain had created few chances against our remarkably solid Magyar defence and even though we had not really created any chances, a 0-0 result was a score we could be content with. The game was definitely going our way as we were containing the Spanish offence and with minimum effort at that. A point against this formidable Spanish team would be an unexpected bonus and changed nothing from the initial expectation that the game against Austria would be the game that clinched which team would qualify for the second round behind Spain. The second half started in similar fashion to how the first half ended; Spain tried to attack rather ineffectual and the Hungarians were smothering all Iberian efforts at penetration before keeping the ball in central midfield, without really looking threatening going forward. It was no surprise at all that the Spanish manager intervened shortly after the break to bring on an additional midfielder. The nigh-invisible Spanish right winger Noé Tejada was replaced by Javi, which forced their attacking midfielder Joseba González wide to the right flank. La Furia Roja effectively played a 4-3-3 with real wingers. As the passing-chart above clearly indicates, this new Spanish tactical effort proved as fruitless as their initial attempt of breaking through using wingers. Most of their long-range passing proved ineffective and the few times a Spanish pass actually reached a winger, the winger was crowded by a host of Hungarian player, which usually ended in the loss of possession for the Spaniards. A few minutes after this rather short-lived experiment, the Spanish manager shook things up again, taking off his left winger Luís Serrano for the forward Jordi Peña and defensive midfielder and skipper Oier Bergara was replaced by the more offensive-minded Francisco Roldán. The Spaniards now lined up in a 4-3-3 with three actual forwards, as temporary right winger Joseba González was moved back into the central area of the pitch. This reshuffling of their offensive personnel briefly confused our defenders, which lead to the one true Spanish chance according to FM. The momentary loss of the central midfield as a staging area for the Hungarian possession-football briefly led to the Spaniards getting in some sort of an attack. According to FM, this tame header was a clear cut chance, which is also the best chance La Furia Roja in 90 minutes of football. Naturally, I sought to re-establish dominance in the central areas of the pitch. I dropped our mentality back to Counter again, which brought our attacking midfielders more or less in line with the Spanish midfield trio, whereas our ball-winning midfielders could sweep up in the space between our offensive trio and our defenders. After my little switch, business as usual resumed. The Spanish were trying to break through a solid wall of Hungarian bodies, whereas we used the ball-winning midfielders to keep control of the ball as much as possible before clearing it long up the pitch. As our ball-winning midfielders now needed some technical skills, I replaced the tenacious duo of Szabolcs Veréb and Gergõ Fedor with the more technically skilled Gábor Gál and Péter Mayer. 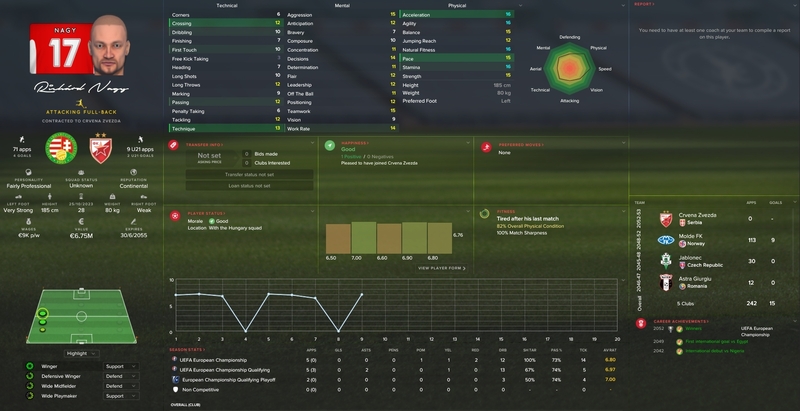 I also switched one of the ball-winning midfielders to play as a deep-lying playmaker. You can see that in a little over half an hour of the match, these two primarily defensive players received and passed the ball quite a lot, taking over the role our attacking midfielders had played in the first half in establishing dominance in central midfield. The interplay between the lines proved difficult to block for the Spaniards. Mayer added a bit more versatility to the midfield setup with his constant movement and incisive passes. The screenshot above indicates how he would generally receive the ball, dribble a bit and either play a short pass or try to release one of his team-mates into space with a long-range pass. One of such attacks even gave us a chance to actually beat the Spaniards. Sadly, Krisztián Végh couldn’t place his shot sufficiently to beat the Spanish goalkeeper Iosu Cosado or we might have won this game. Ultimately, this proved to be the biggest chance in a game that was, from a Hungarian point of view anyway, a resounding tactical victory in which the Magyars negated the Spanish attacking prowess. While statistics are obviously subject to interpretation, it’s quite clear that this plucky Hungarian side gave it their all and came away with a well-deserved point from this match. Now, one could blame a lack of penetration on the side of Spain for this dropped point, but the fact of the matter is that it was the fact La Furia Roja couldn’t establish an effective possession game in central midfield that turned this match into an open fight. Our plucky and energetic Hungarians constantly hounded the Spanish players and chased back quickly when the ball was lost, while Spain was struggling to press in packs. Instead, La Furia Roja could not effectively handle the way the Hungarian midfield was deployed to find space in the central areas of the pitch, with both wing-backs providing wide cover and at times tucking inside to create overloads. Guido, Is this your Wolfpack Tactic ? Yes, but with some tweaks.